Refreshing Apple & Kale Power Salad topped with tart cherries, almonds, blue cheese, and perfectly dressed with apple maple vinaigrette! In large bowl, whisk together olive oil, apple cider vinegar, maple syrup, salt and pepper. 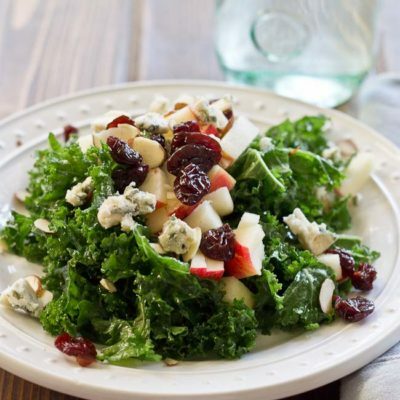 Add kale to bowl, and massage kale with dressing to coat the leaves and begin to soften. Toss in apples, blue cheese, almonds, and tart cherries.